It's well known that Kyle was a big time hunter and had an affinity for Bowtech archery equipment so the company decided to outfit its new "The Legend" bow to reflect the spirit of Kyle's success as a SEAL. You may not be able to shoot as accurately as "American Sniper" Chris Kyle could, but maybe a bit of his sharpshooter mojo will rub off with this new tribute bow from Bowtech. 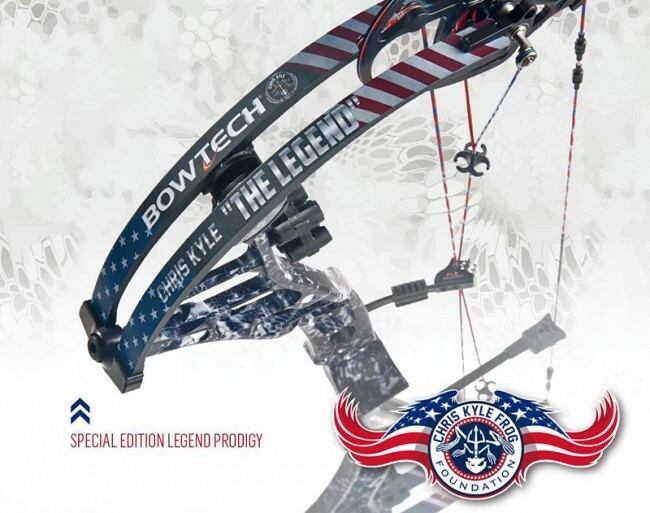 It's well known that Kyle was a big time hunter and had an affinity for Bowtech archery equipment — you can even see actor Bradley Cooper wearing a Bowtech hat in the blockbuster film "American Sniper" — so the company decided to outfit its new "The Legend" bow to reflect the spirit of Kyle's success as a SEAL. Kyle is known as one of America's most deadly snipers and was murdered shortly after he left the Navy. Some of the proceeds from each sale of "The Legend" bow will go to the Chris Kyle Frog Foundation, which helps families reconnect with their loved ones after deployments. The Legend bow is built on the same platform as the company’s 2015 flagship Prodigy bow, which features PowerShift technology, a brand new innovation in compound bow design that allows the shooter to have every bow he wants with zero compromise. The Legend bow comes with a Kryptek Typhon finish and features red, white and blue bowstrings. Additional Bowtech technologies featured on the bow include OverDrive Binary Cams for impeccable tuning and consistency, Center Pivot Extreme for unmatched accuracy and speed and FLX-Guard to eliminate riser torque. Each bow comes with a Chris Kyle Frog Foundation hat.